Walking down the pest control product aisle in the hardware store or garden center gives me a headache. Sure, I know bugs in the garden and yard can cause trouble, but that doesn't mean we need to wage full out, heavy duty chemical warfare. 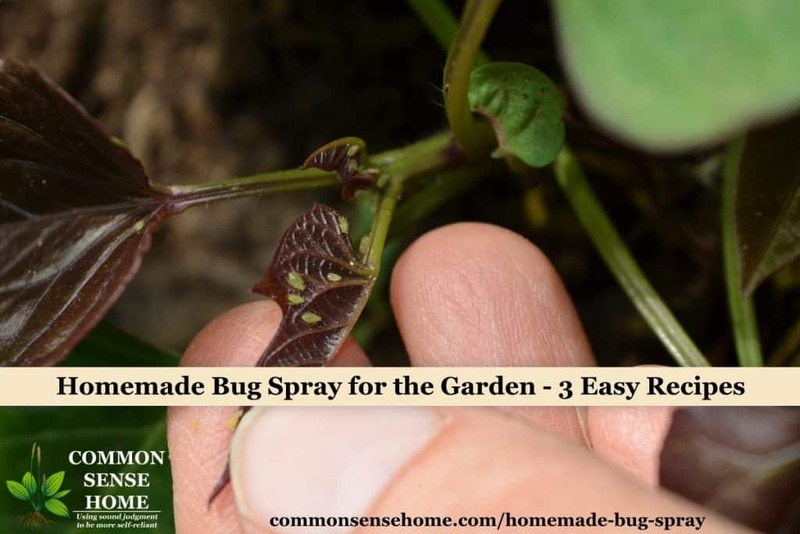 It's easy to make up homemade bug spray for the yard and garden that use plant compounds and soap to knock back your bugs. These sprays can still cause trouble for beneficial insects, too, so use them sparingly, and they shouldn't be put directly on plant parts you want to eat. Use care in handling, washing hand after use and avoiding inhaling the sprays or rubbing them in you eyes. Although they are natural pesticides, they are still irritants. Wash your produce before using. 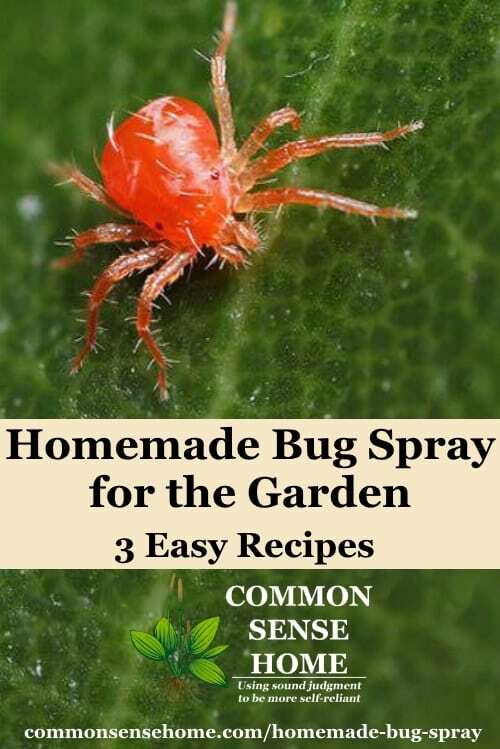 These DIY bug sprays work best on soft bodied insects like aphids, spider mites, thrips, and the eggs, larval and nymph stages of other garden pests such as squash bugs and cabbage worms. They may also get rid of adult insects with hard shells, but they tend to be more resistant and require repeated applications. This brews are best used within a day or two, or stored in the refrigerator for up to two weeks. For a person about 145 pounds (65.7 kg) that's about 25 grams of pure oxalic acid required to cause death. Rhubarb leaves are probably around 0.5% oxalic acid, so that you would need to eat quite a large serving of leaves, like 5 kg (11 lbs), to get that 24 grams of oxalic acid. Note that it will only require a fraction of that to cause sickness. So, don't eat rhubarb leaves or this bug spray, wash your hands after use and your veggies before eating if you sprayed it anywhere nearby. Place chopped rhubarb and water in a glass or stainless steel pot. Simmer for about 20 -30 minutes. Strain and cool. I let this settle for an hour or so and then poured off the top to avoid any sediment, but you could also strain it through some cheesecloth or a flour sack towel. Just keep in mind that chunks may clog your spray bottle. Add a squirt of dish soap (this makes it so the spray penetrates the bug skin better – gross but true). Mix well. Place in spray bottle and apply directly on target insects. This oil based spray is a little longer lasting than a water based spray, because it won't dry up so quickly on the leaves. It's adapted from Rodale's All-New Encyclopedia of Organic Gardening, which has a ton of gardening ideas. This is similar to the pest control recipe in 6 Ways to Use Garlic in the Garden, but more concentrated and less stinky. Place chopped garlic cloves and mineral oil in a glass jar. Let steep for at least 24 hours (longer is fine if you don't get to it right away). Strain. Use as is, or add an equal amount of water and few drops of dish soap. As I explained in the post, “Don't Cry Over Cut Onions“, onions take up sulfur from the soil as they grow, which accounts for their pungent aroma. When they are cut and exposed to oxygen, the sulfur compounds in the onion react to form sulfenic acid, a mild acidic gas. We can use this to our advantage by saving up our chopped onion ends and peels (or cutting up a whole onion if you like) and using them to fight garden pests. Save up your onion scraps in a sealed container. (The longer they sit, the more powerful the smell will get.) Once you have enough bits, cover them in water, close your container, and allow to steep for 5-7 days. Strain and apply to target insects. Fight Your Garden Pests from the Inside Out With Healthier Plants! I have said this before but it needs to be repeated – healthier plants have less bug problems! My friend, Phil, gets into this in more detail in the post, “How to Organically Get Rid of Garden Pests, Forever“. Bee friendly yards and gardens are also friendly for beneficial insects, who can be a huge help in the garden by eating the guys that cause the trouble. Learn more about creating habitat for the good guys in the post “5 Tips for a Bee Friendly Yard“. Check out The Gardener's Bug Book to help you identify the good and the bad bugs in your garden, and learn other methods of bug control. Have any homemade bug spray recipes that you'd like to share? Please leave a comment below. Many herbs can help provide safe bug control for just pennies. I know I'm only scratching the surface with this post. I love your suggestions. I will try them and share them with others. Thank you so much. Not sure where I heard about this one, but the best and easiest remedy for ants farming larval aphids on food plants is to apply a little compost around the stalk of the plant. I have used this successfully on the cabbage and squash families for years. This spring the dwarf cherry I planted last year had aphids slurping away at the tender leaf tips all over the poor little tree. There is an ant nest a couple of feet from the tree, pretty obvious how the aphids got there. I scattered a couple of handfuls of compost around the base of the tree and by the next day the aphids were gone. I think this works on the concept that the plant gets invaded when it is a little nutritionally deficient. The taste of healthy plant sap must be really yucky to ants! The other remedy I tried this year is in response to the appearance of forest tent caterpillars (cousin to the caterpillar larvae of gypsy moths). Patrick (PJ) Liesch at the UW-Madison Dept. Entomology Insect Diagnostic Lab identified it for me and suggested that since there did not appear to be a lot of the caterpillars I could try picking them off. If the situation escalates he suggested a few organic commercial sprays, but I would try garlic or rhubarb, of which I have a patch growing nearby. I am now debating whether I would be wise to wipe out the ant ant hill with a borax bait. If the compost is effective on a continuing basis for the fruit trees, I have a feeling the ants have a generally beneficial effect on soil and forest ecology, and I would rather leave them to do their work. Thanks for sharing the bug link and information. Ants do aerate the soil, so I tend to leave them in place unless they are causing major damage. I find it quite fascinating to observe all the different types of mini-wildlife working in the garden. In the book The Holistic Orchard (and companion video), the author heavily promotes the use of mulch under trees, with mulch made using chopped branches and trees being the best option. We just found out there’s a tree service not too far from us, so we’ve started taking delivery of their chopped tree mulch and are working on mulching the orchards and swales. We’re also working to add companion plants and shrubs. Lots of work, but I can already see positive changes taking place. I would much rather use natural or homemade remedies then any harmful pesticides. I’ll have to give these recipes a try! Thanks for sharing the tips! Great DIY recipes for insect control. I personally use the Garlic recipe as I have seen it help with some of pest control service clients. I own a pest control service company and am always experiencing with new greener ways to provide my service. Great information and a great read!